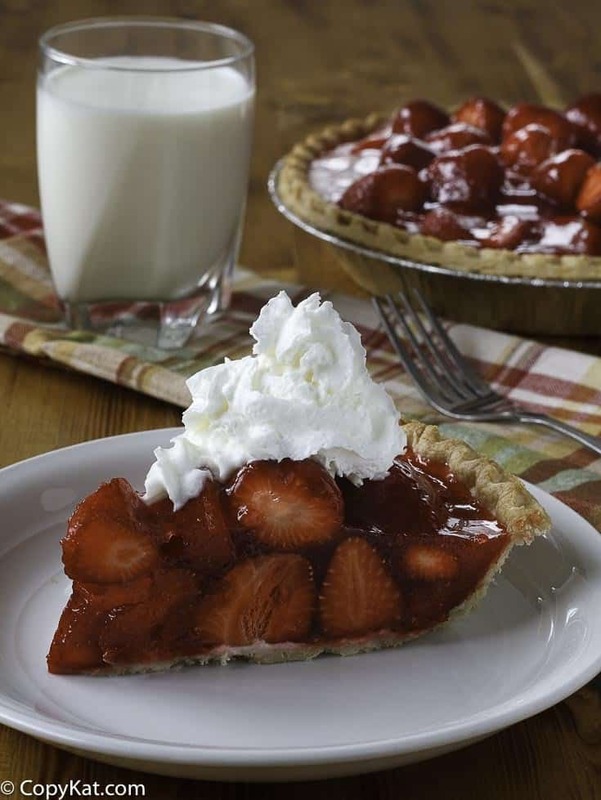 Shoney’s makes a delicious Strawberry pie that is easy to prepare. There aren’t as many of these as their used to be, so you can prepare one at home. Enjoy this delicious homemade strawberry pie when you make it at home. This recipe uses a prepared pie crust. You can either make you own favorite recipe for pie crust, or you may want to buy a prepared one that you bake yourself. I personally think the refrigerated pie crusts are quite good. This is a great recipe for Strawberry pie, it is very simple to make. If you aren’t an experienced baker this is an easy pie to prepare and you should feel confident in making this delicious pie. I love to make this copycat recipe for Shoney’s Strawberry pie during the spring and the summer. Make your own Shoney's Strawberry at home. Put flour and salt in the bowl of a food processor. Cut the butter, and shortening into the flour. Process a few seconds until the mixture resembles a coarse meal. Drop by drop add the water, processing briefly. The whole process should take about 20 to 30 seconds. Wrap and chill for an hour. Remove from refrigerator, and let stand 15 minutes before rolling. (The Martha Stewart Cookbook.) This pie shell will need to be baked before you place the strawberries in the pie shell. Poke the crust with a fork to pierce it all over so when it is baked it won't fluff up. Bake the pie shell at 350 degrees until golden brown. Allow the pie crust to cool before adding the strawberries. In a medium-sized saucepan combine sugar, cornstarch, and 7-UP until creamy. Cook over a medium to a medium-high heat until the mixture becomes thick. When this mixture becomes thick, cool to room temperature, and add a couple of drops of red food coloring. Wash, and cut strawberries into quarters, or smaller depending on how large they are. Sprinkle a teaspoon or two of sugar on the strawberries, and place them into the shell. Pour the cooled 7-Up mixture over the strawberries. Allow this to set for a few minutes. Serve with plenty of Whipped Cream. Hi, have an idea that may remedy a pie that gets runny on second day. More thickener would make too congeled. The sugar probably maserates the strawberries as you would do for strawberry shortcake , so maybe drawing juices out for an hour or two with some of the sugar and subing some of the 7 up with the juices you get would work. It would also make the gel more strawberry flavored. If I make it I will try to remember to follow-up with posting the results. Is it an 8 inch or 9 inch? Maybe you should include directions on cooking the pie shell. New cooks won’t understand that it is assumed in this recipe. You may want to add more thickening in this. I use to work at Shoney’s and this is much like what we use to make.